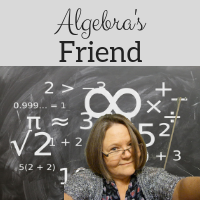 Algebra's Friend: Functions from the start! Monday is the day! I meet my freshmen students on Monday ... and I am excited. After our first day, we will jump into an introductory unit on functions! While it can be a challenging concept, it does lend itself well to math lab activities. I plan to use these two activities during the first week! In this second activity I used Mr. D's poster project as a guide: http://www.teachforever.com/2007/10/project-idea-independent-vs-dependent.html. Excitement is high ... glad there is a buffer day tomorrow ... a day for rest, relaxation, reflection! The independent/dependent variable activity is pure genius. I'm a sucker for cut & match activities, so perhaps I'm biased. Maybe after students complete it, they could devise their own creative versions? Absolutely - they could create their own ... and if you had time in class they could try to stump one another. Bookmarked! Thanks for creating and linking to other sources on this activity.